One of our favorite things about playing any small part in Philadelphia's food scene is being able to recommend restaurants that aren't automatically at the top of everyone else's lists. After all, suggesting Osteria, Barbuzzo or Zahav to a friend is like telling them to go to a Springsteen concert. You know it will rock; you'll want it to last forever; and you can’t wait to go again. But you won’t stand out from the crowd by recommending something everyone already knows about. Our go-to under the radar recommendation has long been Northern Liberties' Koo Zee Doo, one of our favorite restaurants that despite being named the best new BYOB in 2010 still manages to stay lesser known to the masses. Now we can add Southwark in Queen Village to the list. It has been on our hit list for much too long, especially since Messy & Picky and other food bloggers have told us to go there many times. 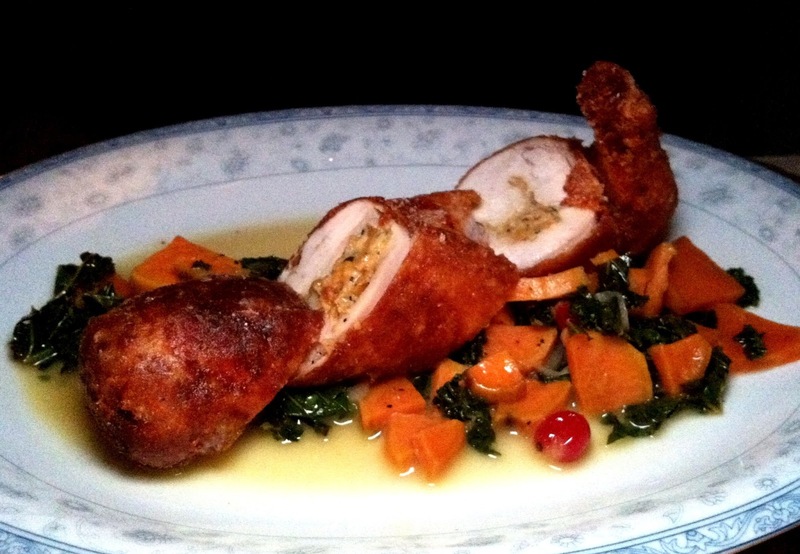 Even Craig Laban listed Southwark as one Philadelphia restaurant deserving more buzz. But it's still not one of those "hot spots" you hear about left and right. We finally got there in early December to discover what the controlled fuss is all about. The bar area of Southwark had such a lively vibe that we almost cancelled our reservation and sat there instead. Several friends have suggested that the bar is definitely worth going to even if you don’t want food. The veteran bartender, Kip, was super nice and even made a cameo appearance on Anthony Bourdain’s recent Philadelphia episode of The Layover. Kristy took a few Twitter friends' recommendations on the Martinez cocktail, made with Hayman’s old tom gin, Carpano Antica vermouth, maraschino liquor and orange bitters, and vouched for its excellence. Alas, we kept the reservation for the main dining section and had a wonderful meal just the two of us. We started with appetizers of clams and roasted potatoes. 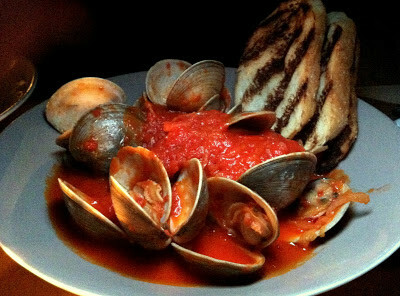 The clams were served in a sauce mixture of dry vermouth, shallots, tomato, dried chili. Fantastic! And they provided not one, not two, but three pieces of perfectly toasted bread. About time someone provides enough bread to soak up all the sauce! The roasted potatoes were also very good, but didn’t quite meet the high expectations that others had set for us. They'd be good to order for a group to share. The highlight of the meal was easily the fried chicken ballotine, as it earned my coveted, “that will change your life” recommendation. The chicken had corn stuffing and came with sweet potatoes and cranberry on the side. If it's on the menu (entrees change frequently) GET THIS DISH! If it's not, I am confident any other chicken dish would be great, too. Kristy went with the braised brisket in a bone marrow butter sauce. Another superb dish. 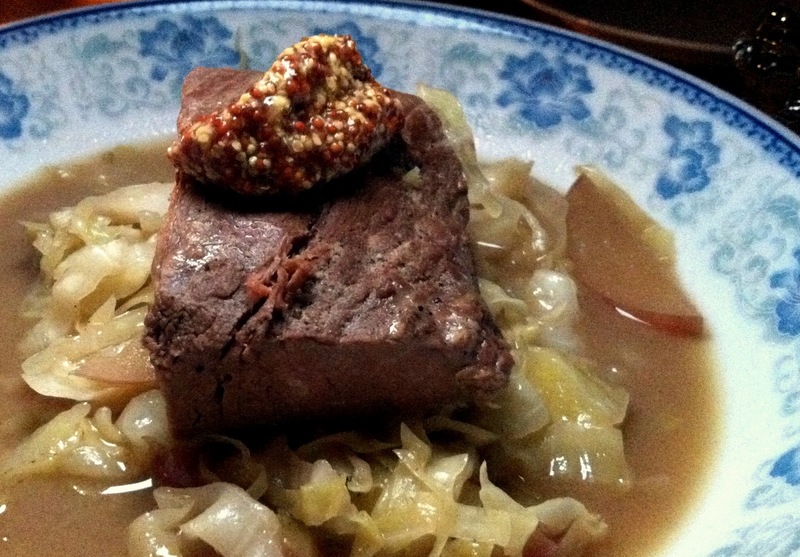 The brisket pulled right apart at the flick of her fork and melted in her mouth. While tasty, the volume of cabbage under it was a little excessive and would have been better as a side. She kept coming back to the feeling that a bed of egg noodles would have been perfect with the meat and sauce. The warm apple crisp dessert was also crazy good, especially the two scoops of homemade cinnamon ice cream piled on top. So, there you have it. A 22nd &Philly recommendation that can help build your own Philly foodie reputation. Warm apple crisp - we asked for extra ice cream!